Truly unique and distinctively modern, these silver metal bottle stoppers deliver on both style and function! Each stopper measures 4 1/2" by 1 1/2" with a conical base that's wrapped with a black rubber gasket. The stylized heart-shaped design sits atop each stopper and sparkles with the addition of rhinestone accents. We nestle the favors on a pillow of white satin inside a black window gift box that is wrapped with a white organza ribbon and heart-shaped "For You" tag. 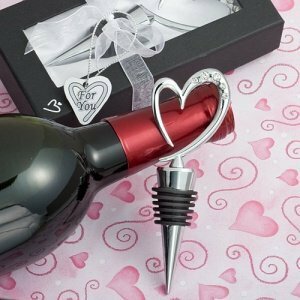 With our tiered pricing, you can buy our heart bottle stoppers in bulk to save big!